After a full day of kindergarten (and two hours of therapy) Caroline Mayers runs in the door with energy to spare. Curious about the stranger sitting on the living room sofa, she approaches. Introducing myself, I extend a hand; she gives it a quick shake and goes on about the more important business of play. Later she returns to sing the “Alphabet Song,” count to 10 and demonstrate her curtsy and arabesque. She identifies pictures of animals, including an elephant and a penguin—all pretty typical five-year-old behavior. Meanwhile, three-year-old sister, Honora, races through the living room on her plastic riding toy; big sister, Emma (age eight) sits primly, conversing with the adults and showing off her grownup manners. Tables dotted with children’s videos, shelves dressed with family photos, walls adorned with “original” art, backyard equipped with swing set—nothing too unusual here. 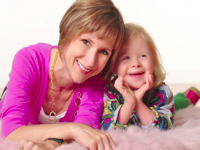 “To the outside world, what makes us different is our middle daughter, Caroline, who has Down syndrome. To us, and those who know her, it is just a physical characteristic. It makes her no different than her older sister’s brown eyes make her different from her baby sister’s blue eyes,” says Kathleen Mayers on her Web site, carolinenfriends.com. Since individuals with Down syndrome often have issues with hearing and sight, Caroline sees several specialists at MUSC who have offered remedies so that the developmental effects are minimized. She participates in physical, occupational and speech therapy locally, maximizing her chance to succeed. Down syndrome occurs when an individual has three, rather than two, copies of the 21st chromosome. According to the National Down Syndrome Society (NDSS), one in every 733 babies born in the U.S. has the condition. A few of the common physical traits of Down syndrome are low muscle tone, small stature, an upward slant to the eyes, and a single deep crease across the center of the palm. However, every person with Down syndrome is a unique individual and may possess these characteristics to different degrees or not at all. People with Down syndrome have an increased risk for certain medical conditions such as congenital heart defects, respiratory and hearing problems, Alzheimer’s disease, childhood leukemia, and thyroid conditions. Many of these conditions are now treatable, so most people with Down syndrome lead healthy lives. For more information, visit ndss.org. On October 31, Caroline & Friends will host its fourth annual Buddy Walk®. The Buddy Walk was established in 1995 by the National Down Syndrome Society with three primary goals: to promote acceptance and inclusion of people with Down syndrome; to raise funds locally and nationally for education, research and advocacy programs; and to enhance the position of the Down syndrome community— to positively influence local and national policy and practice. The local event takes place from 3 to 5 p.m. in the rear parking lot of The Mall at Shelter Cove. It is a leisurely walk (less than a mile from start to finish) that incorporates plenty of food and family fun plus trick-or-treating and a costume contest. Caroline & Friends is seeking walkers, sponsors and volunteers for the event. Donations are encouraged and will be accepted on site. However, if you would like to contribute in advance, please mail checks to Caroline & Friends, 13 Cartgate Dr., Hilton Head Island, SC 29928. Seven percent of the proceeds benefit the National Down Syndrome Society with 93 percent put to work locally. In addition to maintaining its uplifting and informative Web site, Caroline & Friends provides funding for parents to take their children to specialized clinics and to support the additional training of local educators and therapists. The organization is currently producing a brochure to help counteract negative attitudes and eradicate stereotypes resulting from misinformation. The brochure will be distributed in area OB and pediatric offices. call (843) 298-8364 or visit carolinenfriends.org.